"GOOD EVENING NEW YORK CITY"
"It was three great nights for the band and for me personally it was very exciting to be back opening a new stadium on the site of the old Shea Stadium where we had played 44 years previously. Even more exciting because this time round you could hear us!" Paul McCartney's historic three-night musical christening of New York's Citi Field, witnessed by 120,000-plus attendees and universally hailed as a concert experience for the ages, will be immortalized November 17 when Hear Music/Concord Music Group releases "Good Evening New York City". This momentous musical experience will be available in two formats: a 3-disc (2 CD + 1 DVD) standard edition and a 4-disc (2 CD + 2 DVD) deluxe version featuring expanded packaging and a bonus DVD including McCartney's traffic-stopping, headline-making July 15 performance on the Ed Sullivan Theater marquee (including bonus numbers not aired on the Late Show with David Letterman broadcast). The set will also be made available in high quality vinyl. In any configuration, the 30+ songs and nearly 3 hours of music comprising “Good Evening New York City” are a must-have for attendees wishing to relive the July 17, 18 & 21 shows, those who couldn't get tickets and/or anyone interested in an audiovisual document of a living legend. "Good Evening New York City" marks McCartney’s 2nd release for Hear Music. The first was 2007's highly acclaimed Memory Almost Full. The standard version of "Good Evening New York City" will be available at participating Starbucks company-operated locations in the U.S. and Canada and wherever music is sold. 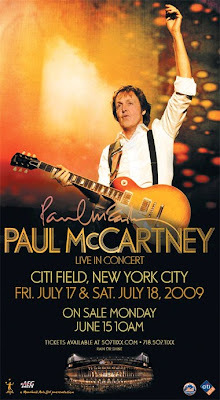 As the inaugural musical event at Citi Field, the site of the former Shea Stadium, the July 2009 shows held special significance not only for McCartney but for generations of his fans. The shows were performed on the same hallowed ground that The Beatles, in 1965, played the 34-minute show that would set the precedent for the modern day stadium rock show--and where in 2008 McCartney joined Billy Joel for the final rock show before the original stadium's demolition. As documented on “Good Evening New York City”, "I'm Down" from the 1965 set list was revived for the Citi Field shows, albeit this time played through a PA that was not overpowered by screaming fans (though there were still several thousand who tried). Other highlights of "Good Evening New York City" include faithful takes on Beatles classics "Drive My Car," "Got To Get You Into My Life," "The Long And Winding Road," "Blackbird," "Eleanor Rigby," "Back In The USSR," "Paperback Writer," "Let It Be," "Hey Jude," "Helter Skelter" and more, plus "Something" rendered on ukulele gifted to Paul by George Harrison, and a tribute to John Lennon in the form of a medley of "A Day In The Life" and "Give Peace A Chance." Wings era chestnuts include “Band On The Run," "My Love," "Let Me Roll It" and the pyrotechnic tour de force of "Live And Let Die," while timeless McCartney solo material ranges from "Here Today" to the upbeat "Flaming Pie" and "Dance Tonight" to a pair of numbers from Electric Arguments, the 2008 album released under the alias of The Fireman. 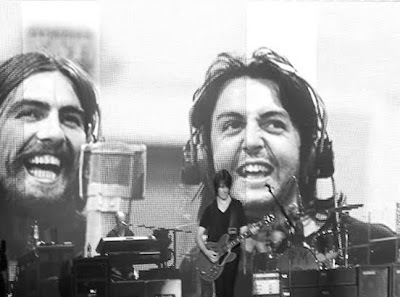 The concert footage featured on "Good Evening New York City" standard edition features concert footage directed by Paul Becher, who has overseen live visuals for McCartney for some 200 performances and counting. The 33-song 2 hour 40 minute performances were shot in High Definition using 15 cameras and digital footage incorporated from 75 Flipcams handed out to fans over the course of the three night stand. The audio mix, in both stereo and 5.1, was handled by longtime McCartney engineer Paul Hicks, whose credits include the recent Beatles remasters, The Beatles Anthology, Let It Be... Naked, and two Grammy awards for his mixing work on the Beatles' Love album. 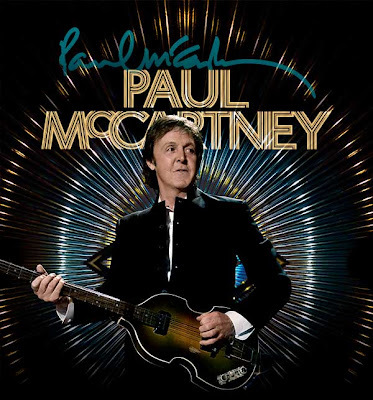 The deluxe edition bonus DVD will feature footage of McCartney's July 15 performance on the outdoor marquee of the Ed Sullivan Theater, previously available only as a webcast on the Late Show with David Letterman website. The marquee set, which marked McCartney's return to the site of The Beatles U.S. television debut, generated front page headlines and literally stopped traffic as word of mouth generated a crowd that packed Broadway from Columbus Circle to Times Square. Paul McCartney's July 17-21 Citi Field stand has already been unanimously hailed by critics and audiences alike as the concert experience of a lifetime. On November 17, "Good Evening New York City" will document it for the ages. So much for the blurb. My question is: This will be available in two formats: a 3-disc (2 CD + 1 DVD) standard edition and a 4-disc (2 CD + 2 DVD) deluxe version, and the latter will also be made available in high quality vinyl. So, I guess he dropped out of the Blu-ray business already? Or is he waiting with it, so we'll have to buy it twice? Once when it's out on DVD and again when he makes the Blu-ray available? Initially, Capitol Records considered recording The Beatles' February 1964 concert at Carnegie Hall in New York, but it could not obtain the necessary approval from the Musicians Union to record the performance. Six months later, Bob Eubanks booked The Beatles' August 23, 1964 performance at the Hollywood Bowl in Los Angeles where Capitol recorded their performance with the intent of releasing a live album in America. 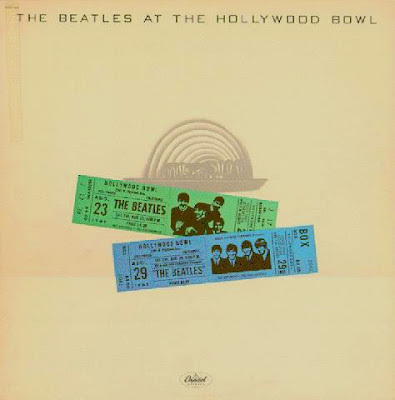 The sound quality of the tapes proved to be inadequate for commercial release; and, when The Beatles returned to the Hollywood Bowl a year later during their 1965 American tour, Capitol recorded two performances by the group at the same venue. The sound quality of the 1965 recordings was equally disappointing. Capitol did, however, utilize a 48-second excerpt of "Twist and Shout" from the 1964 Hollywood Bowl concert on the 1964 documentary album, The Beatles' Story. The 1964 concert recording engineer was Hugh Davies, and the 1965 was Pete Abbott. Both recordings were produced by Voyle Gilmore under the supervision of George Martin. But the results were technically disappointing because of the noise from 17,000 continuously screaming fans resembled a jet airplane as a layer under the music, and the idea of releasing a live album was shelved. In 1971, following his salvage project of the "Get Back" sessions, which was released as the group's Let It Be album, the Hollywood Bowl tapes were given to famed American record producer Phil Spector to see if he could fashion an album out of the material. Either Spector did not complete the job or his production was unsatisfactory, and the tapes continued to sit unreleased for another half a decade. Finally, with a rival record label's impending release of the Live! at the Star-Club in Hamburg, Germany; 1962 album consisting of a fifteen-year-old, poor-quality concert recording of the group performing in the Star Club in Hamburg, Capitol Record's parent company, EMI, decided to revisit the Hollywood Bowl recordings. Beatles' producer George Martin was handed the tapes and asked to compile a listenable "official" live album. He was impressed with the electric atmosphere and the raw energy of the recordings and set to work in January 1977 enhancing and transferring the performances to modern multi-track tapes. In working on the three-track Hollywood Bowl concert tapes, Martin discovered quite a challenge. The first difficulty was finding a working three-track machine with which to play back the master tapes. Once he found one, he discovered that the machine overheated when it was running. Martin and recording engineer Geoff Emerick came up with the solution of blowing cold air from a vacuum cleaner to keep the tape deck cool whilst the recordings were transferred to 16-track tape for filtering, equalization, editing, and mixing. Martin found the August 29, 1965 recording virtually useless, and, except for a few dubs taken from the August 29 performance to augment other performances, the album compiled by Martin consisted entirely of songs recorded on August 23, 1964 and August 30, 1965. (The album cover somewhat blundered by showing the almost completely unused August 29 as the second date used.) In editing together the two performances, Martin successfully captured the excitement of a live Beatles concert with 17,000 screaming fans in this album. The album was released in the UK on 6th May 1977 on the Parlophone label, with the catalogue number EMTV 4, due to it's inclusion in a TV advertising campaign. E.M.I. budgeted £200,000 of advertising on the Beatles release. The album was very welcomed by starved Beatles fans and sold well, it even returned the Beatles to the top of the album charts for one week, seven years after their last number one and seventeen years before their next. The album was released by Capitol Records in the United States (catalogue number SMAS 11638) and hit No. 2 on the Billboard chart. The fold out cover shows items of U.S. memorabilia, and the UK inner sleeve advertised all the Beatles official albums, included the forgotten Beatles album I discussed earlier. The front cover shows tickets from the 23rd August 1964 and 29th August 1965, but these were not real Hollywood Bowl tickets, but Shea Stadium tickets doctored to look like they were from Hollywood Bowl. 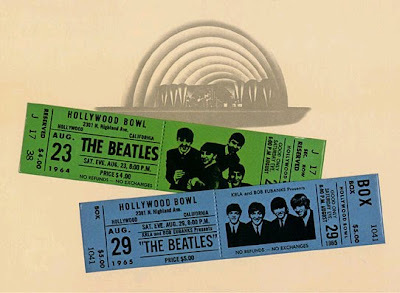 The photo used behind the tickets was an actual shot of The Beatles on stage at the Bowl, but the curved background of the building was blended in using a then-current photograph. Even though the album sleeve says that the recordings were all made on August 23, 1964, or August 30, 1965, "Ticket to Ride" and "Help" were recorded on August 29, 1965, and "Dizzy Miss Lizzy" is a composite using parts from both nights in 1965. 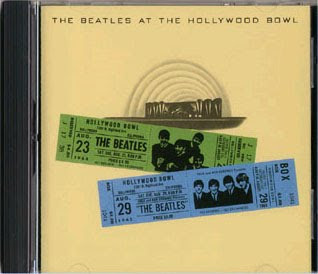 Because The Beatles at the Hollywood Bowl was a compilation of two shows recorded a year apart, a number of songs performed at the two concerts were not included on the album. 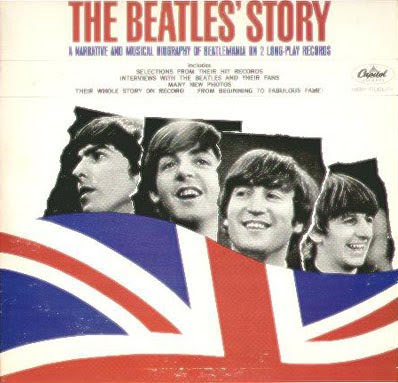 Songs from the 1964 show not included on the album are: "Twist and Shout", "You Can't Do That", "Can't Buy Me Love", "If I Fell", "I Want to Hold Your Hand", and "A Hard Day's Night". Songs from the 1965 show not included on the album are: "I Feel Fine", "Everybody's Trying to Be My Baby", "Baby's In Black", "I Wanna Be Your Man", and "I'm Down". 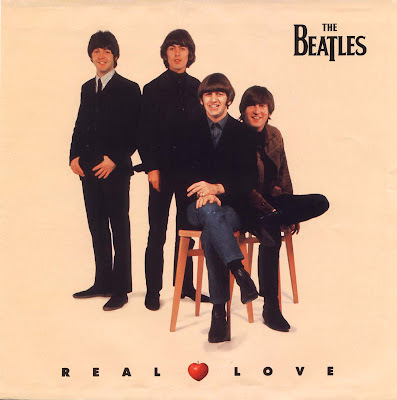 "Baby's in Black", from the 1965 Hollywood Bowl concert, however, was issued as the B-Side of the 1996 reunion "Real Love" single. On 3rd September 1984 the L.P. was re-issued on the E.M.I. budget label "Music For Pleasure", catalogue no. MFP 4156761. 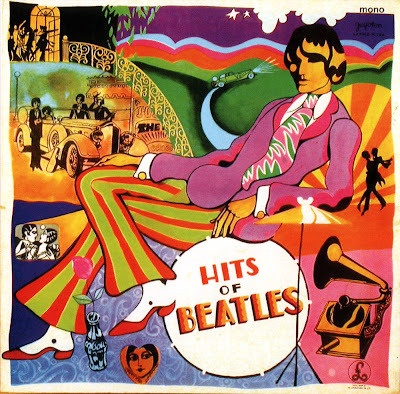 Three years later, when the Beatles catalogue was made available on CD, this album was not included, and it has never appeared on an official CD. "Over twelve years ago the Beatles appeared for the first time at the Hollywood Bowl in Los Angeles. It was not long after they had made their first impact on the United States, but already two years after I had signed them to a record contract for EMI. Frankly, I was not in favour of taping their performance. I knew the quality of the recording could not equal what we could do in the studio, but we thought we would try anyhow. Technically, the results were disappointing; the conditions for the engineers were arduous in the extreme. The chaos, I might almost say panic, that reigned at these concerts was unbelievable unless you were there. 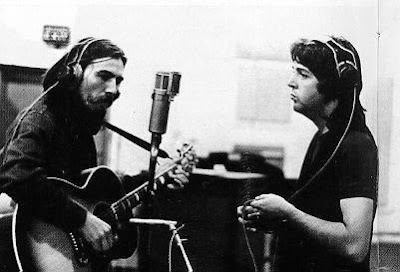 Only three track recording was possible; the Beatles had no "fold back" speakers, so they could not hear what they were singing, and the eternal shriek from 17.000 healthy, young lungs made even a jet plane inaudible. A year later, in 1965, John, Paul, George and Ringo appeared again at the Hollywood Bowl and again Capitol taped the show for posterity. And there the tapes remained for over a decade. Neither the boys nor I considered they should be used, because they consisted of titles that had already been issued as studio recordings. 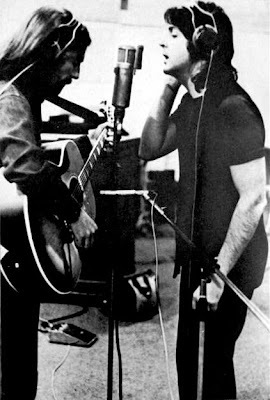 We often spoke of making a live recording, and in fact the ill-fated 'Let It Be' album began as an attempt to make a live record of new material. It was with some misgivings therefore that I agreed to listen to those early tapes at the request of Bhaskar Menon, Capitol's president. The fact that they were the only live recordings of the Beatles in existence (if you discount inferior bootlegs) did not impress me. What did impress me, however, was the electric atmosphere and raw energy that came over. And so, together with my recording engineer Geoff Emerick, I set to work to bring the performance back to life. It was a labour of love, for we did not know if we could make them good enough for the world to hear - let alone John, Paul, George and Ringo. We transferred the vintage three track tapes to modern multi-track, remixed, filtered, equalized and generally polished the tapes. Then, by careful editing from the two performances, we produced the performance that you hear now. Obviously there has been no redubbing; all the voices and instruments are the original performance (some of the vocal balances with three singers on one track is evidence enough), but it is a piece of history that will not occur again. 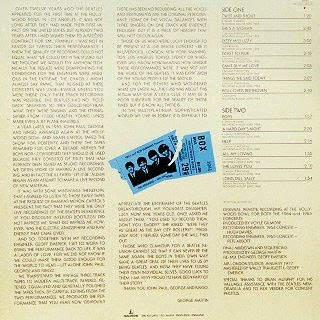 Those of us who were lucky enough to be present at a live Beatle concert - be it in Liverpool, London, New York, Washington, Los Angeles, Tokyo, Sydney or wherever - will know how amazing, how unique those performances were. It was not just the voice of the Beatles; it was expression of the young people of the world. And for others who wondered what on earth the fuss was about, this album may give a little clue. It may be a poor substitute for the reality of those times, but it is now all there is. In the multiplatinum, sophisticated world we live in today, it is difficult to appreciate the excitement of the Beatles breakthrough. My youngest daughter Lucy, now nine years old, once asked me about them. 'You used to record them, didn't you, daddy?' she asked, "were they as great as the Bay City Rollers?' 'Probably not,' I replied. Some day she will find out. Thank you John, Paul, George and Ringo." The Beatles at the Hollywood Bowl album is easy to find used, but you need a turntable to be able to play it. Of course, the CD void has been filled by bootleggers, in fact the full 1964 concert was available on a vinyl bootleg years before the official album! All the original tapes from the concerts have also later leaked, so you can now pick up the full concerts, for instance in Purple Chick's live series or it's source, The Complete Hollywood Bowl Concerts 1964-1965 from Midnight Beat, or the reproduction by Reproman. Purple Chick is working on a BBC upgrade release based on the recent "Beatles At The Beeb" broadcast, and also including a handful of "unbooted bits and pieces here and there (all chat, no music, unfortunately)." Most of all, the new release will be sonic upgrades of some material that was on the 2004 version in inferior quality. Purple Chick will also include any material you may have in your collection, so if you are sitting on something that is either unbootlegged or something which is an upgrade to the chick's 2004 collection, please upload it to sendspace, rapidshare or megaupload, and write the link as a commentary to this post. It will be passed on. The upgrade will not be a new definitive BBC set, just an add-on release to the 2004 release, so you'll still need that version. Stay tuned, and I'll alert you when the upgrade project is done. 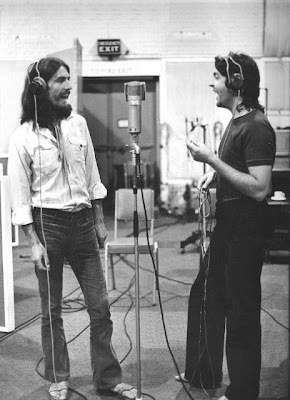 Inspired by Tammy's recently published photo of George and Paul from the sessions for the Abbey Road album, I gathered together the photos I had on my hard disc drive from that same occasion and here they are. George and Paul are clearly enjoying this moment. This was the photo Tammy published, which was taken at a recent McCartney concert. It was part of the backdrop. 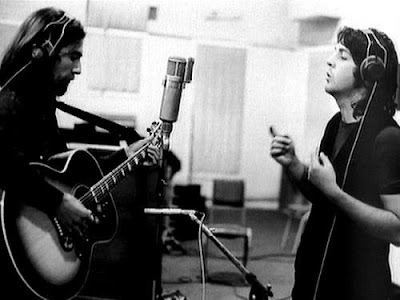 Photos from the Abbey Road album recording sessions are otherwise few and far between. 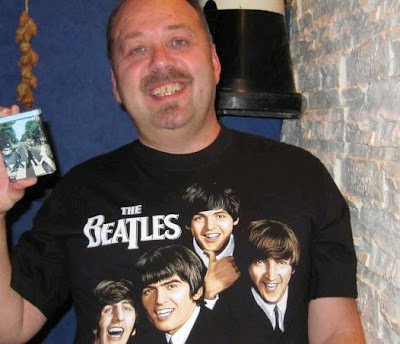 When the album had it's 40th anniversary on Saturday, I happened to be in Istanbul, Turkey, so I celebrated the day by buying a new Beatles t-shirt! There's an upcoming live DVD+CD package to be released on November 15th on the Concord Music/Universal label featuring stuff from Paul McCartney's summer tour of North America. No details or cover photos yet, I'm afraid. What started out as individual concert dates was eventually referred to by McCartney as a tour by the end of it. Because of this, concert posters etc were not uniform, they were all individually designed (check out the posters at our Live Solo Concerts site). It's unknown whether footage from all locations will be used in the upcoming release (early rumours say only Citi Field concert footage is included), as reports from the fans indicate that every concert was filmed. It's likely to be a 2DVD+2CD package, and early reports suggest a retail price of around a whopping $60. 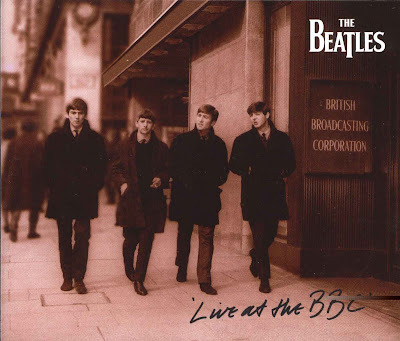 As you probably know, the 1993 album "The Beatles Live At The BBC" is just the very best of the songs the group recorded exclusively for BBC radio in the sixties. The Beatles performed for 52 BBC Radio programmes, beginning with an appearance on the series Teenager's Turn—Here We Go, recorded on 7 March 1962, and ending with the special The Beatles Invite You to Take a Ticket to Ride, recorded on 26 May 1965. 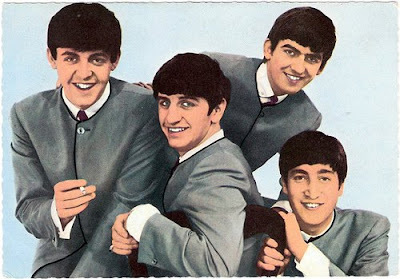 47 of their BBC appearances occurred in 1963 and 1964, including 10 on Saturday Club, and 15 on their own weekly series Pop Go The Beatles which began in June 1963. 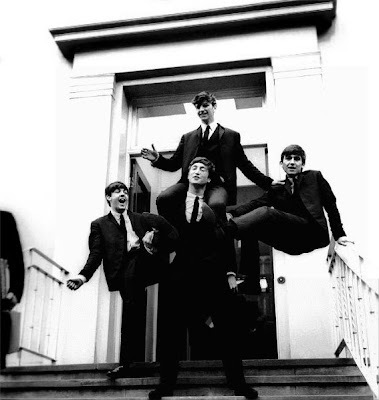 As The Beatles had not accumulated many original songs by this time, the majority of their BBC performances consisted of cover versions, drawing on the repertoire that they had developed for their early stage act. In total, 275 performances of 88 different songs were broadcast, of which 36 songs never appeared on their studio albums. The BBC didn't keep their tapes. Once the programme was broadcast, tapes were probably wiped to make room for new recordings. 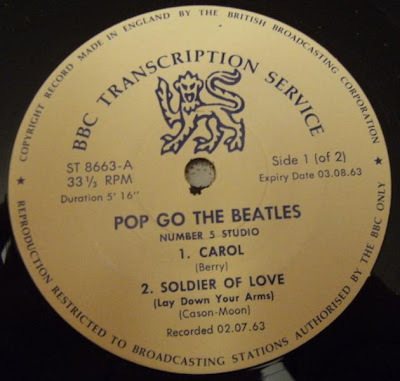 They did however, press vinyl records of some shows for broadcast on other BBC affiliates around the world, and the BBC transcription departement distributed these. And people were taping radio shows off-air at home. In the early seventies, bootlegs started appearing with songs from home made tapes of the shows, starting with the LP "Yellow Matter Custard". To commemorate the 20th anniversary of their first BBC appearance, the BBC aired the two-hour radio special "The Beatles at the Beeb" in 1982, featuring a mix of BBC performances and interviews. The show was expanded to three hours when syndicated to other countries. The show's producer Kevin Howlett also released a book, "The Beatles at the Beeb, '62-'65: The story of their radio career" on the subject. The more comprehensive series "The Beeb's Lost Beatles Tapes" was broadcast by BBC Radio 1 in 1988 as 14 half-hour episodes. When gathering material for that series, only a small number of original tapes were located, but the BBC transcription records provided them with more material. 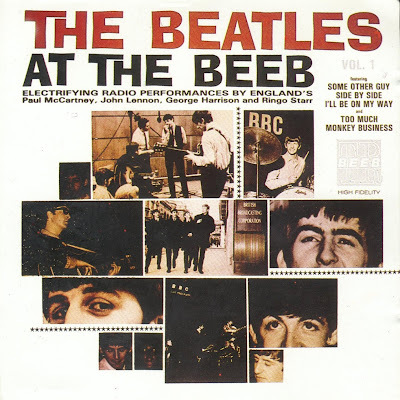 Bootleggers mined the radio shows for a 13 LP series, The Beatles at the Beeb, which were also padded out with home made off-air recordings from collectors. The covers were lovely parodies of non-UK Beatles LP covers, and the series also made it on to CD after a couple of years. Then in 1993 came a boxed set from the italian company Great Dane, which had all the songs from the "Beatles at the Beeb" series and then some, all chronologically arranged over 9 CD's, and with a colourful booklet which chronicled the BBC radio shows and the previous bootlegs. They soon had to release a single disc with some material which appeared after the box had been released. Legend has it that the Great Dane boxed set was actually a legal release in Italy, because italian copyright laws meant that the copyright on these recordings had expired there. The Beatles had to take action, and as they had now settled their lawsuit with Capitol/EMI, they were free to start releasing new material from the archives, and the official 2CD, 2LP "The Beatles Live At The BBC" became a reality. 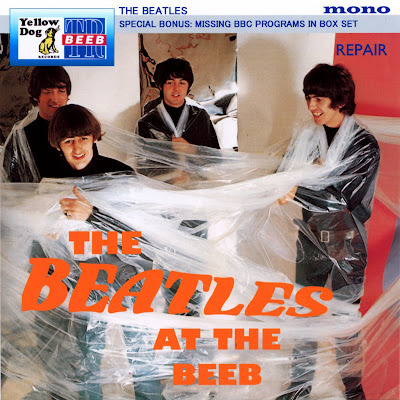 An official Beatles BBC album was being planned as early as 1989, and it was reported that "EMI was preparing an album" of the BBC material by late 1991. To supplement the archive he had partially rebuilt for The Beeb's Lost Beatles Tapes, BBC Radio producer Kevin Howlett sought out additional sources, such as tapes kept by people involved in the original sessions; others had contacted him after the series aired to inform him of their own home recordings of additional broadcasts. Remaining gaps were filled by recordings taken from available bootlegs. 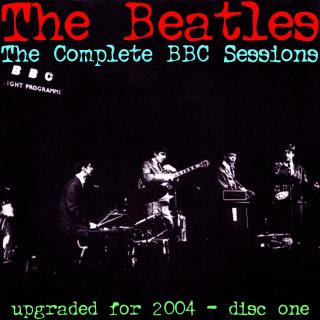 From the available recordings, the tracks for Live at the BBC were selected by longtime Beatles producer George Martin. Martin's selection criteria included both the quality of the sound and of The Beatles' performance. Of particular interest were the 36 songs that The Beatles never performed on their official releases, of which 30 were selected for the album. 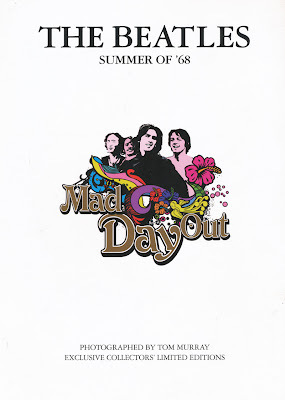 In all, 56 songs were chosen for the album, along with some banter among the group and the hosts. 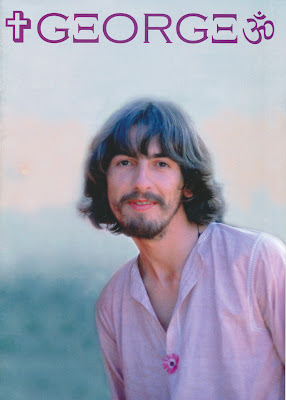 Three additional songs were released on the "Baby It's You" 4-track single. Abbey Road engineer Peter Mew used audio manipulation software to reduce noise, repair minor dropouts, and equalise to a more consistent sound from one track to the next. The resulting sound quality was considered generally better than the best equivalent bootlegged versions available at the time, although a small number of tracks were noted as exceptions. Live at the BBC peaked at number 3 on the U.S. Billboard 200 album chart and reached number 1 on the UK Albums Chart. The album sold an estimated 8 million copies worldwide during its first year of release. But the fans needed more. This was in their eyes, merely a "best of". And as the Great Dane boxed set was due for an upgrade, and in 2003, in came notorious bootleg label "Yellow Dog" with a 12 CD boxed set, also titled "The Beatles At The Beeb". And after the boxed set, they issued a disc 13 "repair disc", featuring tracks that had appeared since the boxed set was released. The homebrew label Purple Chick had discovered that part of the material on the Yellow Dog set was sonically inferior to other versions available on other bootlegs, and released their own version of the boxed set as internet downloads, free of charge in 2004. This was deemed the most complete set for collectors of the Beatles radio appearances, until now. On August 31st 2009, BBC radio 2 broadcast another radio programme with material from the sixties shows, again produced by (now independent producer) Kevin Howlett. Some, if not all of this material was sonically superior to the versions on Purple Chick's set. 06. 'Saturday Club' 1-26-63 - 01a. "all over the country"
16. 'Saturday Club' 5-25-63 - 00a. "our bill-toppers"
23. 'Pop Go The Beatles #4' 6-25-63 - 05a. "no relation to John"
23. 'Pop Go The Beatles #4' 6-25-63 - 06a. "we'll all be at it again soon"
26. 'Pop Go The Beatles #5' 7-16-63 - 03a. "I haven't got a passport"
30. 'Pop Go The Beatles #8' 8-8-63 - 01a. "please make George sing"
30. 'Pop Go The Beatles #8' 8-8-63 - 03a. "a very romantic title"
30. 'Pop Go The Beatles #8' 8-8-63 - 04a. "the Teddy Bears' version"
30. 'Pop Go The Beatles #8' 8-8-63 - 04b. 'I've got a terrible nose"
33. 'Saturday Club' 8-24-63 - 03a. "what box"
36. 'Pop Go The Beatles #13' 9-10-63 - 05a. "can't remember him"
36. 'Pop Go The Beatles #13' 9-10-63 - 06a. "for this week, that's it"
42. 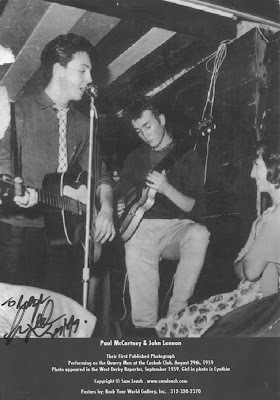 'Saturday Club' 12-21-63 - 01a. "what would they be without amplifiers"
43. 'From Us To You #1' 12-26-63 - 00b. "The Beatles are here"
43. 'From Us To You #1' 12-26-63 - 08a. "a house with love in it"
43. 'From Us To You #1' 12-26-63 - 09a. "from The Beatles themselves"
45. 'From Us To You #2' 3-30-64 - 01a. "just a rumour"
45. 'From Us To You #2' 3-30-64 - 02a. "i don't think you need the telling"
48. 'Top Gear' 7-16-64 - 03a. "hold it"
48. 'Top Gear' 7-16-64 - 03b. "don't pass me by"
52. 'The Beatles (Invite You To Take A Ticket To Ride)' 6-7-65 - 04a. "the producer asked for it"
No doubt, another bootleg title will follow. 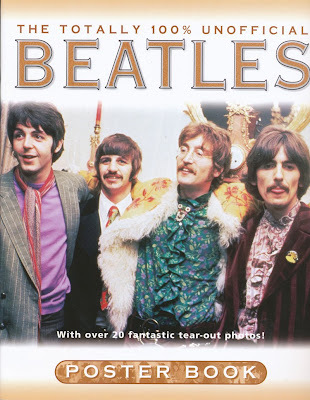 Oh, and Kevin Howlett's book was republished in 1996 as "The Beatles at the BBC: The Radio Years 1962-70". It's currently out of print again, but can be found used. It's essential reading for any Beatles follower. Yes, here it is. The game has been mined for songs, so now you can burn them on a 2 CD set or stick them in your favourite mp3 player. 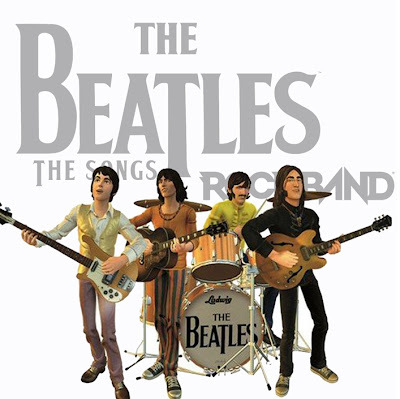 The songs from The Beatles:RockBand are different than the versions you find on the Remasters boxed sets. One thing is that they all have count-ins, not just "I Saw Her Standing There", but every song. Another that they're not faded out at the end (or in, like "Eight Days A Week"), they all start and finish in a natural way. And third, they're remixed by Giles Martin, son of Sir George. The early songs are almost mono, with just a hint of stereo presence. They're easy on the ear in headphones, unlike the stereo "Please Please Me" or "With The Beatles". And "I Am The Walrus" is stereo all the way through. As a bonus, you get the studio chat that plays under the credits. Look for it on the internet. In October, Abbey Road. November: Sgt Pepper. December: Rubber Soul. And then, who knows? And here's how to get them all. A Collection of Beatles Oldies (but Goldies!) was a very real and important 1966 official UK album by The Beatles. 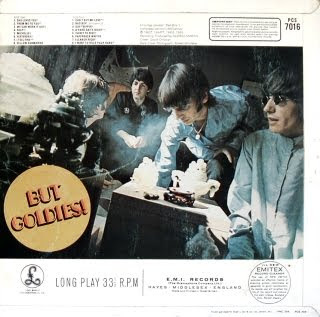 It was also released in several other countries (especially in Europe) and it remained in print, as part of the Beatles catalog until the CD age, when it was replaced by the more thorough compilation Past Masters Vol. 1. The Beatles had rush-recorded an album for the Christmas market in 1964 (Beatles For Sale) and 1965 (Rubber Soul), but they were busy doing other things in the autumn of 1966 and weren't going to obey EMI's demand this time around. So EMI had to think of something else. And what they came up with, was the first UK compilation album of the Beatles hits, together with what one today might have called a bonus track, "Bad Boy", which had yet to be released in the UK. The album also compiled six tracks that had previously only been out as singles in the UK, now finally they were available on an album. The album was released in both mono and stereo, and since all the singles had been in mono, new stereo mixes had to be made. The songs in question: She Loves You, We Can Work It Out, Day Tripper, I Want To Hold Your Hand. The stereo mixes were made by producer George Martin and involved the Beatles new engineer, the young Geoff Emerick, who had taken over from Norman Smith as the Beatles' engineer, starting with "Revolver", as well as balance engineer Peter Brown. Work commenced on October 31st, 1966. Martin had booked the control room of studio One in Abbey Road for three hours, and was hoping to mix three songs within that space of time, "Paperback Writer", "She Loves You" and "I Want To Hold Your Hand". When he found that "Paperback Writer" took two hours alone to mix, he called it a day. They reconvened on November 7th, and Martin again underestimated the workload, hoping to remix three songs again, the two leftovers from the previous session, "She Loves You" and "I Want To Hold Your Hand", and in addition: "From Me To You". Only "I Want To Hold Your Hand" was finished by the end of the session. The next day, they tried again to remix "She Loves You". Unfortunately, the original twin track tape had gone missing (and remains lost to this day), so all they had to work with was the one track single master. Emerick made two attempts, and the result was a song with "mock stereo", created by making the left channel all bassy and the right channel all tinny. On November 10th, they mistakenly created a stereo mix for "This Boy", because they had it mixed up with "Bad Boy" and finally "Day Tripper" and "We Can Work It Out" was mixed. The stereo mix for "From Me To You" was never done, and the song appears on the stereo album as on the original two track tape, with instruments on the left and vocals on the right. The harmonica edit piece on the intro was overlooked, and can only be found on the mono single. The bonus track "Bad Boy" was recorded by the Beatles on May 10, 1965, (the song's composer Larry Williams' birthday), along with Dizzy Miss Lizzie (another Larry Williams composition) and was first released on the American album Beatles VI in June 1965. So it took a year and a half before it was finally included on a UK album. The 1966 stereo mix of "This Boy" was finally released on "Past Masters vol 1" after having been available only on a Canadian single since 1976. The album was released on December 10, 1966 on EMI Parlophone as PMC 7016 (mono) and PCS 7016 (stereo). 2. "From Me to You"
1. "Can't Buy Me Love"
4. "A Hard Day's Night"
8. "I Want to Hold Your Hand"
All songs by Paul McCartney and John Lennon, unless otherwise noted. The album only reached number 7 in the UK album chart (and number 12 here in Norway), perhaps because most fans already owned most of the tracks on other releases. However, the album continued to sell reasonably well, and remained in print for many years. It was also the longest album (pre-1967) that the Beatles released, totaling almost 40 minutes of music. The mono pressing is somewhat of a rarity, and is missing in most people's collections. 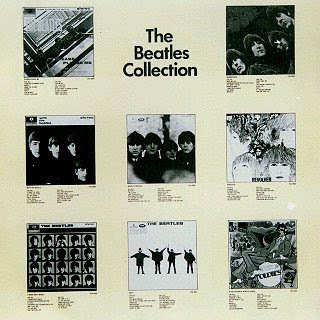 In December 1978 EMI gathered together the 12 first Beatles-LP's (from Please Please Me to Let It Be,minus "A Collection Of Beatles Oldies"), put them in a box (blue cardboard box with golden lettering, EMI BC-13), added a poster and the extra LP "Rarities" and named the result The Beatles Collection. This was the first time "A Collection Of Beatles Oldies" was left by the wayside by EMI. 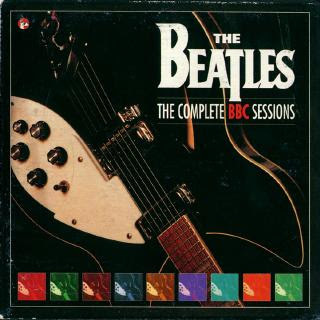 But the "Rarities" compilation couldn't quite replace it, and new fans who thought they had found a way to get a complete Beatles collection soon found themselves buying "A Collection Of Beatles Oldies" in order to get "She Loves You", "From Me to You", "We Can Work It Out", "I Feel Fine", "Day Tripper", "Paperback Writer" and "I Want to Hold Your Hand", all of which were missing on the blue box. In addition, they also had to get "Magical Mystery Tour", "Hey Jude" and the "The Beatles At The Hollywood Bowl"-LP in order to get a real complete Beatles Collection. Of course, the latter is another lost Beatles album! "A Collection of Beatles Oldies" was finally rendered obsolete when EMI released the "Past Masters" compilation on March 7th 1988, but European long time Beatles fans remembers the album fondly, and probably wouldn't have protested if it had been reinstated as a CD within the Beatles Remasters. OK, so The Beatles are in the charts again, following last week's Remasters releases. I'm of course going to first focus on the all important Norwegian chart: "VG-lista". VG is the biggest newspaper in Norway, and their weekly record charts have been reigning supreme in Norway for many decades. This week's albums chart has more than a hint of country and western flavour. Norway's Top 40 Albums week 38, 2009. The individual album sales have been disappointing, what people want is the stereo boxed set. Unfortunately, it's sold out - EMI Norway didn't have enough boxed sets to supply to the shops the actual amounts each shop had ordered. Too bad. But still - hey! They placed third! With a huge and expensive box! Billboard's Top Comprehensive list is the one to reckon with, because Billboard's more famous "Top 200" list has been given a limitation: It now only lists new and current albums, so it no longer reflects the real Top 200 biggest sellers. Why on earth did they make that decision? 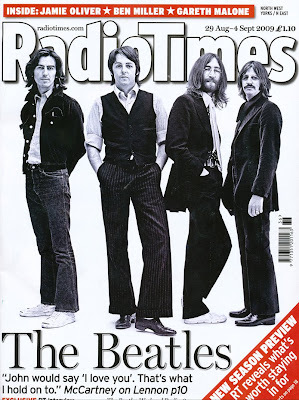 The new Beatles Remasters have been scrutinized and some of the background noises are revealed in this excellent blog, with audio examples. John Lennon blurts out Blat! or Black! in what seems to be the backing vocal track. Believe it or not, there’s a rock drum beat throughout For No One, but it’s buried way down in the mix. During the breakdown near the end of the song, John makes groaning noises and Paul says some random things, like Come here son! and I’ll show you…get my bloody hands on you, come on! You can hear some brief studio chatter, lip smacks, and a soft hoo during the intro of the stereo version. John lets out a flat ahh between the second verse and pre-chorus. This was removed in the 1999 Yellow Submarine Songtrack remixed version. Someone coughs or sneezes in the middle of the mono version. Get on over there and have a listen! I'm finally coming around to something I promised you a week ago - a look at what I bought at the Liverpool Beatles Week this year. I'm not really someone who goes to Liverpool that particular week, I've only done it twice. I went there in 1996 as part of a Beatles trek with three friends, and I came back this year. I've been to Liverpool several times between those years, but I've tried to avoid the Beatles Week, which is the last week of August. Why? Because the city is crowded with Beatles fans, Beatles freaks, Beatles music, cover bands and it's total overkill. 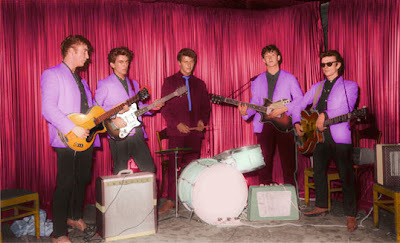 But I wanted to go to see the Pete Best Band playing live at the Casbah Club for the 50th anniversary of the venue, and that occurred in the midst of that week-end. So, since I was in town anyway, I did also attend the convention at the Adelphi for a couple of hours the following day, Sunday. As we landed at the airport, we were met by a Norwegian friend who had been there since tuesday, and he greeted me with a copy of Liverpool's own music paper "Mersey Beat", which was included with the Liverpool's daily newspaper, the Liverpool Echo. 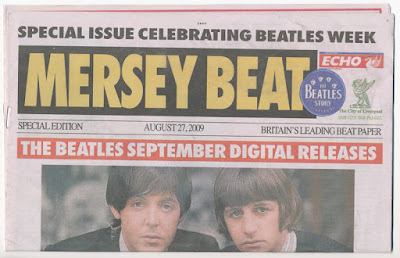 As fans of the Beatles, I'm sure you know about this newspaper "Mersey Beat", which had a big impact on the Liverpool music scene in the early sixties. John Lennon used to have his own column there, Brian Epstein was reviewing records and selling the paper from his NEMS music stores, and I think the paper closed down some time around 1966. Some times the original editor Bill Harry gets to release a special issue of the magazine, and I think this was the second time in 2009 that the paper was a freebie with Liverpool Echo. 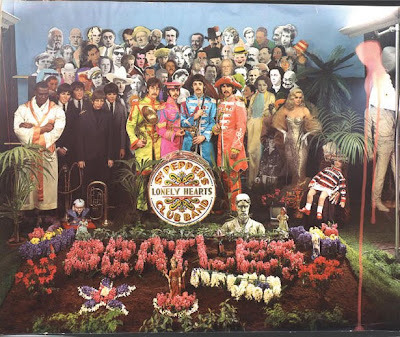 The unedited Sgt Pepper cover photo, before they painted over Gandhi's face. It was a steal at only £2 and it's now hanging on the wall in my Beatles room (every Beatles fan has one, right?). 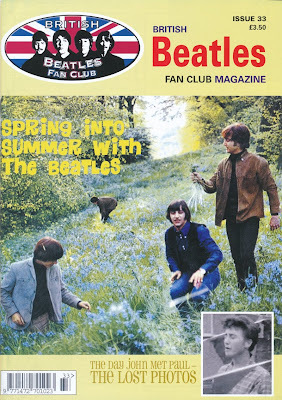 Secondly, I always pick up the current issue of The British Beatles Fan Club magazine, whenever I'm in England, so I got my latest copy of that one. I'm a relatively poor guy, so I'm never spending a lot of money on anything - I guess that's one of the reasons I don't do these conventions - it's frustrating to see all the goodies I can't afford! And some of the nicer items I would just like to own are the original tour programmes. This time I lucked out and found a vendor who was selling replicas of the Australian tour programme for just a few pounds. 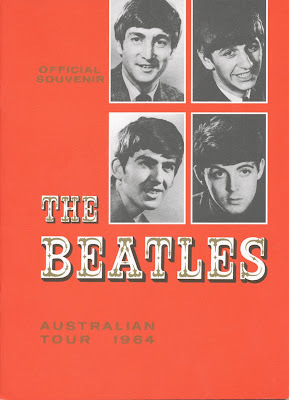 The programme was reprinted in 2004 for the 40th anniversary of that particular tour. The same vendor was also selling a £2 tear-out poster book with some nice photos, so I got that one, too. One thing I didn't get around to see when I was in Liverpool, was an exhibition of some of Tom Murray's "mad day out" photos, but I was able to buy the exhibition catalogue. At one stall which was selling photos, I was amazed to find my own colourised version of the Beatles at the Indra Club! I told the vendor that it was me who had done the colourisation, and he then proceeded to ask me for my autograph on the back! Here's the story of that photo. 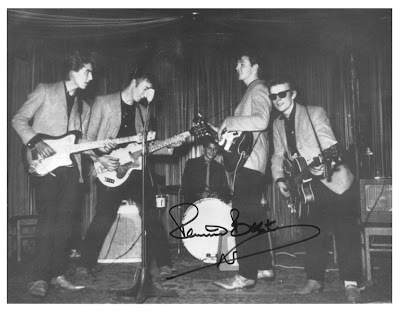 The day before the convention, I actually bought a copy of another photo taken on that same occasion, and with Pete Best's autograph. Early sixties maverick promoter Sam Leach had a stall at the convention, where he sold his new DVD together with some copies of old photos, which he personally signed. I didn't bother him, because I had already paid him a visit at the Grapes pub the day before. Sam is also coming to Norway later this month, for the Beatles week-end in Drammen, which I won't be able to attend. Something else I did, was of course to see a couple of exhibitions that were going on while I was in Liverpool. One of these were put together by fans of George Harrison, and was appropriately held in St George's Hall. It was an amazing collection of memorabilia, and unfortunately it had to close, following a theft. 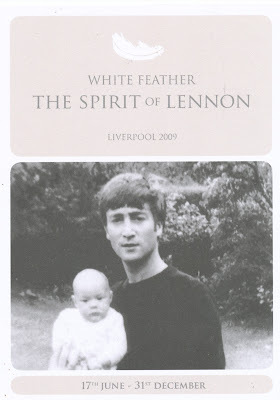 Another exhibition was Julian and Cynthia Lennon's "White Feather" event, where some of John Lennon's personal belongings were on display. The "White Feather" exhibition was held at the new Mersey ferry terminal, and we were also treated to another little event there, an animated adventure in 4D featuring Beatles songs. It was a fun thing, and I recommend it especially for those travelling with kids. Unfortunately, the Beatles songs featured were cover versions, but it was still a bit of harmless fun. 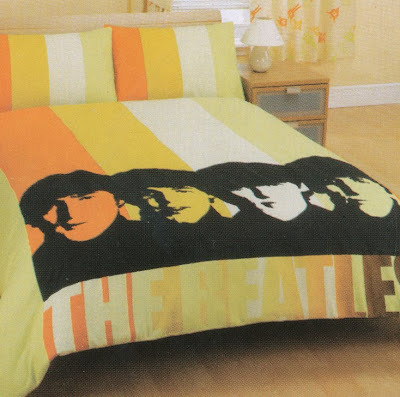 The final thing I wanted to show you was something I had been looking for for a long time, a Beatles duvet for my bed! I finally found it, in the gift shop over at the A Hard Day's Night hotel. After returning home, I looked it up at Amazon, and here's an advert for it - in case you're tempted! Giles Martin and your's truly outside Abbey Road Studios, July 2009. In 1987, as the Beatles catalog was due for their first CD release, producer George Martin wanted to go back and remix the sixties version of stereo to something a bit more updated for the modern ear. Because of a rushed release schedule, he couldn't do this for the first four albums, Please Please Me, With The Beatles, Beatles For Sale and A Hard Day's Night, as they were due for release in February 1987. So, as a compromise, they were released in mono, which were mixes the producer was satisfied with. The next batch of releases were Help!, Rubber Soul and Revolver, due out in April 1987, and this time, Sir George had time to prepare updated mixes for these. He had a listen, and while he thought Help! and Rubber Soul needed remixing, he was satisfied with the sixties stereo mix of Revolver and all the albums that followed. Over the years, Beatles fans and music lovers have been rather critical to the 1987 mixes of those two albums, especially because they brought in an amount of echo and reverb which hadn't been present on the sixties stereo mixes. Then, when the remasters were announced, these fans were shocked that they were once again to use these inferior 1987 remixes for the general release of the remastered catalog (albums available individually and as part of the stereo remasters boxed set). In a telephone interview that Detroit's Classic Rock station's (FM 94,7) Deminski and Doyle conducted with Giles Martin, son of Sir George, the producer unexpectedly was able to shed some light on why the eighties mix was re-used. Deminski and Doyle had made several erraneous assumptions, first of all they thought that Giles was involved in the remasters project, secondly they assumed that the remasters were also remixed, not just remastered. As these assumptions were both untrue, the interview do provide an insight into the narrow world behind the walls of Abbey Road studios and the hap-hazard manner in which things happen. Giles Martin was in the studio, remixing the Beatles songs that were going to be used in the The Beatles:Rock Band game, singling out specific instruments from otherwise interlocked studio tapes, so he was able to talk a bit about that process. Giles Martin: Rubber Soul and Help! were remixed by my dad in 1988 or '87 for CD. And when we did "Love", we got to do Yesterday, and I couldn't understand why there were so much echo and reverb on the voice 'cause it was very non-Beatles. And it was only when I came back and I was listening to the remasters I asked "how come this is the case?" and they said "well we are remastering the eighties versions of [Rubber Soul and Help!]" and I said "why aren't we remastering the originals, we should remaster what came out then [in 1965]?" And they said "Well, your father wouldn't be very happy with us not remastering the versions he did in the eighties." So I spoke to my dad and I asked "Do you mind if they remaster the sixties version?" and he went "I don't even remember doing them in the eighties!" Allan Rouse in an interview with Record Collector: "The remasters were based on the master-tapes, with the exception of two albums: George Martin's 1987 mixes of Help! and Rubber Soul. People are questioning why we used those. George Martin is the fifth Beatle. He chose to do it. You can argue with him, but I'm not going to." So there you have it! The stereo remasters are the 1987 remixes out of the involved remastering engineers' misguided respect for Sir George! Now, the original 1965 stereo mixes are not lost to the world, because they are an added bonus on the mono remasters of those albums, but these are only part of the mono boxed set, and are not for sale to the general public as individual albums.